Now that Mr. Hardly-Looks-450’s birthday is over, the time seems ripe to discuss musicals based on Shakespeare plays. God, there’s a large quantity. They include two of the greatest musicals ever, Kiss Me Kate and West Side Story, and an infamous and underrated Tony winner, Two Gentlemen of Verona. But also a slew you haven’t heard of, such as two of the better-written productions from The New York Musical Theatre Festival, Like You Like It and About Face (Much Ado About Nothing). I think writers glom on to the plots of the Bard for all the wrong reasons. One is the belief that fans of the plays will want to see them adapted with songs. But I couldn’t spot any Merry Wives of Windsor fans at Lone Star Love; with all the empty seats, you’d think it would have been easy. Now, I’m very sympathetic to the idea that acquiring rights to adapt works that are under copyright can be very expensive; public domain stuff, naturally, makes for an appealing source. But Shakespearean plots, particularly the comedies, lack the stuff that we expect a good musical’s story to have. There are unlikely coincidences and implausible set-ups, such as the pair of twins who just happen to have servants who are also twin brothers in The Comedy of Errors – the first Shakespeare play to be turned into a musical (The Boys From Syracuse). If a librettist came up with an original plot like that, he’d be laughed off the stage. But knowing that Shakespeare utilized the same odd twists, well, that makes it O.K. somehow. Truth be told, I toiled for a while on a musical Merry Wives of Windsor set in Soprano-land; an old friend had taken the trouble to translate every line into mafia slang, and thought there might be a musical there. And God knows the women’s revenge on the old knight story engine worked as an opera. But opera, I dare say, has totally different standards for what makes a good plot than contemporary musicals do. Indeed, Shakespeare’s plot-lines, borrowed though they are, work pretty well for plays of his period. Today, when we take in an Elizabethan comedy, we excuse it – we accept a deus ex machina – because that’s how they did things in the reign of Good Queen Bess. And we probably didn’t come to the theatre to enjoy the storyline, anyway. 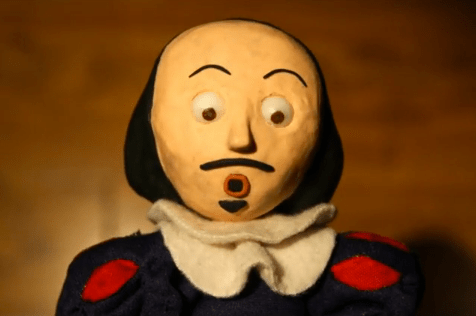 The audience for your show, knowing it’s based on Shakespeare, might excuse you, too. But do we really want to create shows we have to excuse ourselves for? It’s a lot more common for writers to reset Shakespeare in a different time and place. I tried to do that with the aforementioned Merry Wives, and so did NYMF shows, Desperate Measures, Like You Like It and About Face. The mother of us all is West Side Story, one of the few shows to ever successfully make social commentary on a contemporary societal ill. It uses Romeo and Juliet, in a fairly straightforward manner, to shine a light on New Yorkers’ prejudice against recently transplanted Puerto Ricans, and also juvenile delinquency in general. The nurse is now “Doc” and the balcony is now a fire escape. The toughest plot turn to accept is the spreading of the untrue news that Maria is dead. The Jets’ manhandling of Anita shocks us so, that what she blurts out, in desperation, seems perfectly plausible. And motivated. You’re going to need to have justification for every character’s action, and West Side Story is a paradigm everyone should take note of. My career as a composer has involved setting Shakespeare’s lyrics on many occasions, including that production of The Winter’s Tale when I was a college freshman that led to some key connections. And a critic for a New York daily newspaper singled out my numbers for praise above all else in the Shakespeare-based play, Couplets. The act of finding tunes that illuminate his texts, I think, gives me a different relationship with the Bard than most. By letting certain syllables extend, others soar, amplifying in loudness or highness, etc., I, like an actor, choose what meaning to bring out. You should try it, sometime. When I was a teen, my composition teacher made it an assignment. He even played me his setting of “Tell Me Where Is Fancy Bred?” I recently composed to the same verse, realizing, as I played with it, that if I emphasized the words wrong, it might sound as if the singer was looking for some chi-chi bakery. Reading press about a so-called “new” Broadway musical that recently opened has left me hopping mad. So it’s time for a rant. About a subject that cuts close to the bone: musicals that are concocted using pre-existing songs. The hubris and idiocy involved are too appalling to go without comment. It’s a wonder I don’t write these screeds more often. Picture, if you will, the creation of any great musical, from Show Boat to Nine. Who do you see? 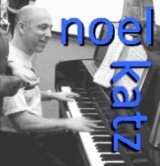 Certainly a composer, filling staves with tunes that fit the characters, situations, the time and place. And you can picture a lyricist, rendering some of the most dramatic moments of the show in flawless rhyme. And don’t forget the librettist, structuring the story, defining the voice of the characters, and, I’d hope, packing in some punch lines. If picturing a hit from the more recent end of the spectrum, you might include the director, so instrumental in how the story gets told, often sending the three writers back to the drawing board. That close-knit group has been the well-spring of every good musical I can think of, and probably your favorites as well. Because – and this can’t be restated enough – musical theatre is the most collaborative of art forms. There aren’t a lot of auteurs here. (Yes, I’ve been responsible for book, music and lyrics all by myself several times, but I can’t bring myself to talk about Such Good Friends without crediting director Marc Bruni.) And I’m not getting all Kumbaya on you when I say that most of us believe that what makes musicals great is that they’re the product of several fine minds at work. If you don’t buy into that concept, you probably shouldn’t be allowed near the creation of a musical. And yet such myopic twerps are; it happens all them time. We live in an age littered with so-called “original musicals with unoriginal scores.” And that’s indicative of a horrifying skittishness, a lack of faith in the time-tested collaborative process. The coward being talked about is Woody Allen. The most prolific movie director and writer, someone who’s used to being an auteur, fought against adapting Bullets Over Broadway for the stage for years. But when his sister pointed out he wouldn’t have to collaborate with pesky songwriters, his resistance evaporated. The popular and esteemed director-choreographer Susan Stroman is, in essence, Woody’s collaborator, but a living breathing person who can throw notes on a staff, rhymes on a page: Who needs ‘em? With wedding invitations all over my refrigerator, I find myself thinking, more than I usually do, about bridal dresses. If you saw the budget for Our Wedding: The Musical, the big-ticket item that would leap out at you is Joy’s dress, which she had made for her. Because that’s what you do. If you care about your appearance, to a certain degree, you don’t just pick something off the rack and call it your wedding dress, do you? This is really beyond my area of expertise and this whole paragraph is just an excuse to include a photo of Joy in that dress. The poor choice at the center of this jukebox musical: Instead of coming up with new tunes, Allen shoehorned period songs into the existing plot. But all this does is throw the show into neutral whenever the orchestra swells. Even well-performed, the oldies simply underline what’s going on. Me, too, Terry, and I find myself indulging in a little fantasy that goes like this: Suppose the Ford Motor Company decided to fire all the welders on their assembly line, keeping important car parts together with glue. You know what would happen: The cars would fall apart, people would stop buying them, bankrupting the company. But before that day came, the Welders Union would cry loud and hard. “You can’t manufacture autos without welders. That’s just stupid. And unsafe. Welders are valuable, damn it.” Just goes to show how show business is unlike big business. Composers and lyricists are valuable, don’t you think? We don’t have a union, though. And there’s no hue and cry when producers put out a product without songwriter input. There should be a hue and cry. Consider this the start. Obligatory admission: I haven’t seen Bullets Over Broadway, and, for all I know, I might find it enjoyable. But the mere fact that Woody rejected working with living, breathing, intelligent and creative songwriters (a slap in the face to a large community of talented folks) is more offensive to me than anything he’s ever done. Every single thing that happens in If/Then is new… We keep clamoring for smart musicals that don’t just rehash some well-known property or lard it with songs we heard 30 years ago. At the same time we want stories that speak to something we feel now, whose developments we don’t anticipate ten or 120 minutes ahead of their arrival, or indeed before we enter the theater. If/Then surely answers all those needs. You absolutely never know what is going to happen, right up to the last, surprisingly moving beat. Which notice would you rather receive? Something that’s always true in opera is sometimes true in musicals: certain roles are written for certain voice types. The director of a revival that ignores this risks ruining something built into the show. 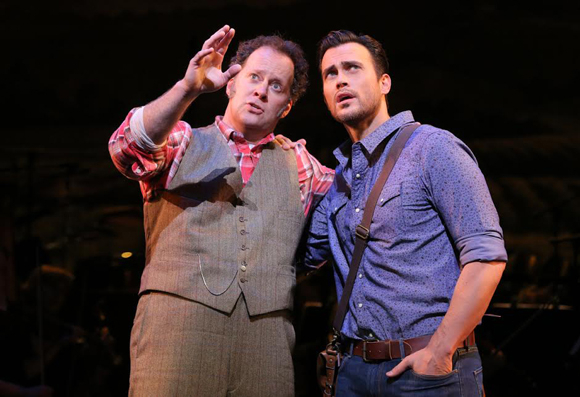 Of course I’m thinking about Shuler Hensely’s distinctly un-operatic sound in The Most Happy Fella the other week at Encores. But so much else was wonderful about that evening, I realize I’m picking a nit. As I said the night it opened, there could be no better example of How To Write a Musical than seeing that glorious show. Hensely’s acting was excellent; he’s great in other things. I once rode a city bus with him, and that was a great ride. But Encores has now miscast him twice. Last year’s Fiorello used him as the ultimate New York pol. Hensely’s many things on many occasions: a New Yorker he’s not. Another thing that got me thinking about all this was finding out that Giorgio Tozzi – the first Tony I experienced – had been in the cast of A Doll’s Life but was replaced before it opened. I imagine that was quite an upheaval: was a role designed for an operatic baritone suddenly switched to a Broadway bari? How must have the composer felt? When Tozzi essayed Tony, the passion he expressed through his powerful dynamics was a major component in making The Most Happy Fella a stirring emotional experience. “And I feel so young; and I feel such joy!” Tears poured out of me like a fire hydrant in summer. I recently talked with Stephen Schwartz, who’s always open to new and different ideas about staging his old shows. So I’m reminded of the York mounting of The Baker’s Wife with comedic character actor Jack Weston. One of my favorite Schwartz songs, Any Day Now Day fell a little flat because Weston lacked the vocal power to convey the inherent desperation and false bravado. Speaking of The Baker’s Wife, did you ever notice how it ha very similar characters and story arc to The Most Happy Fella? Can you imagine Rosabella getting a six-minute fairy tale allegory to justify her straying at the act break? Now you know why The Baker’s Wife never made it to Broadway while The Most Happy Fella has been to the Main Stem three times. Knowing the voice teachers I know, the more I speak of singing, the more I feel I’m out of my league (and into theirs). But you know we’re not talking vocal ranges per se here: it’s more about vocal quality. Alfred Drake, everyone seems to agree, was the greatest baritone Broadway’s ever known. A revival some years ago of one of Drake’s great vehicles, Kiss Me Kate, had Brian Stokes Mitchell filling his shoes. And I thought, Yes, of contemporary musical theatre stars, Mitchell’s good casting. He has the right type of voice, a tough guy’s power, with deep sonorities that boom and bellow. A year or so after I saw it, the same director mounted a revival in London starring Brent Barrett. And I thought, I love Brent Barrett but he’s abundantly wrong for this. He’s more of a light tenor, with admirable prettiness in contemporary roles. But that’s completely inappropriate for Kiss Me Kate. Must admit an original cast album, played over and over again, can leave quite an impression. And there’s a problem with that. If what was caught that one day in a recording studio is so splendid, it can be hard to accept a different vocal take, no matter how valid. People I know who thought Shuler Hensley was wonderful in The Most Happy Fella, nine times out of ten, were wholly unfamiliar with Robert Weede’s sound on the original cast recording. And sometimes I’ve experienced an odd reversal: I saw My Fair Lady with a leading man sang way too well compared with the original Rex Harrison. What was the poor guy to do? The abrupt and sudden postponement of Hearts and Lights at Radio City Music Hall is a thunderbolt reminder of the fragility of this business. And since I can’t seem to avoid those huge ad posters everywhere, the bolts keep coming. A new musical – or was it? Some controversy on this – with a huge budget and unusually large cast and crew suddenly and without warning, pulls the plug, leaving its talented workforce instantly unemployed. I’m not voicing a criticism here: it’s all too sad. If writers are to glean something from this, it might be helpful to think about the difference between a desk fan and an automobile. At my father’s house is a frightening fan that must be over 50 years old. You’d think such a thing would have long since gone to a museum of twentieth century artifacts but it still works. Cars, on the other hand, break down so frequently, our streets are lined with garages and mechanics and we think nothing of it. Gas guzzling motor engines are so complex, we expect something to go wrong. Electric fans, on the other hand, are so simple, they can run a lifetime. And where in the world can you find a desk fan repairman? That show you’re working on: is it a fan or a car? Does it have so many moving parts, it’s a near-certainty something will gum up the works? Or is it so modest in scale, it’s a safer bet the damn thing works? The longest running musical ever involves a small cast on a bare stage, accompanied by two musicians (The Fantasticks). When we think of fiascoes that lost all of their sizable investments, Spider Man: Turn Off the Dark leaps to mind first. For me, who missed the arachnid all-time top money-loser, my mind goes to a couple of Frank Wildhorn shows, Wonderland and Dracula, as well as the legendary flop by writers I admire, Nick and Nora. All had an unusual number of characters, way too many sets, and plots that no viewer could ever follow or care about. I recall Nick and Nora having an extremely long period of previews on Broadway. At the time, one hoped (and imagined) the creators were using that time well, making fixes. But it can be hard to employ a last-minute change in a piece with car-like complexity. It’s far easier to believe that an alteration can go into an uncomplicated single-set piece, such as Man of La Mancha, and save the day. Leads one to wonder why people fashion behemoths in the first place. One thing I suspect is going on in the minds of big builders is an unrealistic vision of what musicals are. When MGM, in its heyday, made musicals – or, more to the point, films about the making of musicals, such as The Band Wagon – they’d often show a cast of hundreds, accompanied by a 100-piece orchestra. Film is flim-flam, of course. It makes more sense to get your idea of what stage shows are by seeing a lot of live theatre. But that brings up another widespread misconception: that musicals need to move like film. Some do, of course, and they’re often thrilling, but the magic involved relies on the director and designers’ art. When writers seek to ape film fluidity, they’re often barking up the wrong tree. A theatergoer sees action all around: if one wishes, one could snap one’s head back and forth like watching a tennis match. The movie camera cuts the field of vision to exactly what the director wants you to see. It could be a close-up of a falling tear, or the broad battlefield at Gettysburg. The stage tradition – and I think many have forgotten this – is to have, far downstage, a drop or curtain. This comes down to block us from seeing large scene changes behind it. In front come performers who do scenes or songs “in One.” The term refers to the front-most lighting area. Some of musical theatre history’s best-loved moments are in One numbers, such as Brush Up Your Shakespeare or On the Street Where You Live. Now, nobody’s writing these things today, but it’s always helpful to remember our tradition, which differs in many key ways from the history of film. What works in film often feels reductive in the theatre. While film is fluid—forward motion, wrapped in light—the stage is a solid, fixed in front of us; whatever you put on it has to stand there with the irrefutable weight of fact. Stallone’s version is too deeply imprinted on our collective imagination. Timbers, like Karl, has to contend with the simulacrum problem – that is, the challenge of making something new out of something tried and tested. Some fine musicals were made from well-known films. It’s been nearly forty years since the Rocky film, but Promises Promises, for example, was based on The Apartment, the Oscar-winner from earlier in the same decade. It didn’t feel the need to recreate much of Billy Wilder’s piece-de-cinema, and, as you might have noticed, it didn’t retain the title. Master producer David Merrick relied on the quality of the writing (by Neil Simon, and the hottest songwriters of the time, Bacharach and David) and not the title of a fondly-remembered-film to put butts in the seats. I’ve yet to adapt a film into a stage musical, but can understand the appeal of having a good dramatic structure in place at the beginning. One of the pieces I’m working on now has a cast of two (as did my long-running comic opera for kids, The Pirate Captains). I’ve written large-cast, multi-set shows before, but, there’s so much that can go wrong in the writing of a musical: It feels infinitely better to build and tinker with a desk fan rather than a car. I’m telling you to hustle over to City Center to see The Most Happy Fella this week because musical theatre writing doesn’t get any better than this. (Productions of The Most Happy Fella certainly get better than this – more on that later.) You want to understand how a show can be the most emotional and cathartic experience possible; it’s best to view that paradigm, with full 38-piece orchestra, plus another 38 performers on stage (and they cut the kids!). We can talk about what makes a musical great (as we do here). We can play through every note of the entire three-act score (book, music and lyrics all by Frank Loesser) as I’ve done countless times. We can read it. We can listen to the original Broadway cast in its entirety, as Columbia Records released it on three long-playing albums. (There was a slight skip in mine, and I’m so used to it I was thrown when, live, the moment passed smoothly.) But none of that comes close to the experience of seeing it in a theatre. So go. And if you’ve seen it before, see it again. You’re going to learn as much about crafting a masterpiece as you will seeing any other show, in addition to having a wonderful time, enjoying it. The Most Happy Fella is a simple and serious admirably-adult romance, liberally peppered with comic songs and characters. One thing that struck me was how frequently the tone switches from poignant drama to frothy daffiness. A vastly inferior behemoth like Les Misérables is content to wallow in abject solemnity for forty minutes at a time. Many much more moving things happen in The Most Happy Fella, but they’re soon leavened with wit and dancing. As a result, one never gets tired of the emotions. And I’m reminded of another contrast between The Most Happy Fella and contemporary musicals: the shortness of the songs. There’s certainly a lot of them – the lack of dialogue misleads some into calling it an opera – but they make their point and then we move on. In some cases, Loesser lets the music convey the subtexts which lesser writers (there’s that inevitable pun; sorry) would have spelled out in words. Come on back in the house for a smile of welcome and go to sleep. That stanza and its tune shouldn’t work at all: they’re simplistic in the extreme. But, in-between the lines, Loesser repeats a stormy leitmotif. Its contrasting harsh harmonies and unusual intervals tell us something is going on. We watch this and are unsettled by, at first, a sense of foreboding: Why is this sweet bit of comfort being interrupted in this way? We come to understand that there are lustful feelings flinging back and forth like lightning bolts. If these characters give in to the passion, everything we’ve come to love will be destroyed. Before the cadence, the character being coaxed to bed breaks it off with piquant dialogue. This is accompanied by physicality, and then the man speaks, truthfully, of his admiration for the title character. When the original Don’t Cry song returns, the accompaniment conveys a sense of water bursting through a damn. We’re all rushing to a very dark place and the curtain comes down, giving us a ten minute intermission to mull over the implications. Mamma, mamma, up in the heaven: How you like my sweetheart? And, if performed in three acts, we get another ten minutes to consider that irony. I can remember seeing a production and crying through every minute of that interval. I’m no baby. I know what I want. I want holding you very close to me, just as close to me as I possibly can, not like a child: But like a woman holds a man. My wife, she’s-a love me now! My wife, she’s-a fall in love with me! Casey Nicholaw’s staging at Encores! starts weak but gets better and better and before the halfway-mark it’s irresistible. Cheyenne Jackson and Heidi Blickenstaff, the second leads, are extraordinary, the former gets to be appropriately croony and swoony and never smarmy. Laura Benanti didn’t wow me in the opening scene, and is more than a decade too old for her role. But, once in Napa, she captivated. It’s hard to imagine anyone working today who could bring better acting values and emotion to material in such an amazingly high tessitura (by musical theatre standards). Shuler Hensley, unfortunately, lacks the vocal power to bring the larger-than-life verve to the main character. Loesser’s gorgeous score is conceived for a strong operatic baritone. Every time the piece needed power from its lead, we got a somewhat soft, merely serviceable note. But, as Loesser’s widow Jo Sullivan (the show’s original leading lady) reminded us in a pre-show seminar, the acting is far more important than the voice, and Hensley had that in spades. You are currently browsing the There's Gotta Be a Song blog archives for April, 2014.